Have you committed to living the concealed carry lifestyle and in the process tried all the holster options resulting in a drawer full of holsters? The Problem Solver is for you. This is the answer providing true concealability whether you are wearing shorts, jeans, or full business attire. 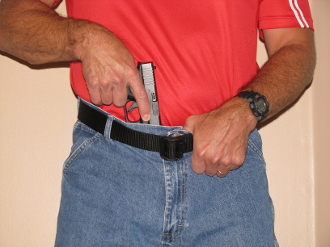 The pocket itself has no visible seams for your firearm to catch on while drawing. Rip stop nylon is used on the outside for non-friction sliding against your garments and protecting your weapon from moisture. Cloth used on inside to protect your firearm. Closed cell rubber foam padding used between layers for comfort, to protect your firearm, protect the trigger, and aid in a consistent clean draw. No Velcro used on this holster which ensures long lasting use (no worn out Velcro), comfort, and protects your garments from snagging on the Velcro hook sided tape. The manufacturer of this holster assumes no liability or responsibility for your use or misuse of this holster or any firearm. You are responsible to always use safe firearm practices at all times. Additionally, it is your responsibility to learn and follow all applicable firearm laws in your area. You are responsible to follow all safe and lawful firearm practices and to receive proper training in firearm use. The manufacturer assumes no liability or responsibility for you or your safety.